The reviews are in and this year’s Run to Babylon is a smash hit with the MINI Maniacs. 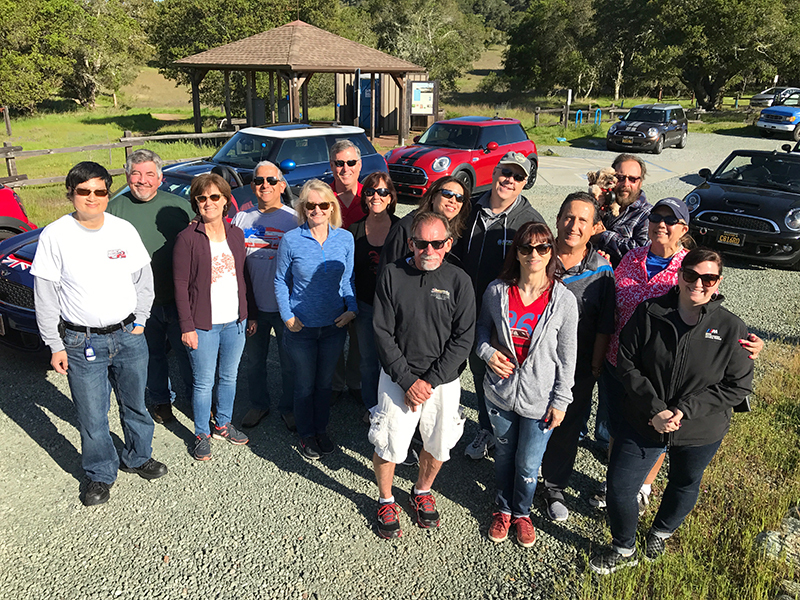 The four-day adventure kicked off April 19, with an overnight in Santa Cruz at the Sea & Sand Inn. The motel is perched high on a bluff overlooking the Pacific Ocean and the City’s famous boardwalk and wharf. Members enjoyed wine and cheese on the patio before strolling down to the wharf for dinner at Splash. After a full day of driving and dining it was back to the motel where everyone was lulled to sleep by the sound of gentle waves crashing on the beach below. Day-two began with a beautiful sunrise and the roar of sea lions barking in the distance. Our final destination today would be Corte Madera, but there was much to see and do first. The first stop, just minutes from the Sea & Sand Inn, Kelly’s French Bakery (because breakfast just isn’t enough for MINI Maniacs). The drive from Santa Cruz followed the coast north, offering views of the rugged shoreline and eventually the beaches of San Francisco before the caravan made its way through Golden Gate Park and over the iconic bridge into Marin County toward Sonoma, for a group lunch at Hopmonk Tavern. After the meal, many chose to walk around Sonoma’s city plaza and browse the many shops and galleries before settling into the motel in Corte Madera, and relaxing at the Wolfman’s Lair. The day wasn’t over just yet though. The group had dinner reservations at Salito’s Crab House & Prime Rib later that evening in nearby Sausalito. Amazing scenery around every turn! Saturday’s itinerary was another jam-packed day that started with scenic run through Mount Tamalpais State Park. Members Tom and Patti McMurry led the run. Tom grew up in the area and is familiar with the local roads. The drive was spectacular. At times in dense forest, and then the trees would give way to rolling hills and wild flowers, and amazing views of the ocean and the San Francisco skyline. It was two hours of eye-popping scenery before returning to the motel in time to relax a bit. The rest of the day would be spent in San Francisco, without cars. The MINI Maniacs boarded the Larkspur Ferry for the 50-minute boat ride to San Francisco. The ferry passed by San Quentin State Prison, historic Angel Island and Alcatraz, before arriving in San Francisco. We had about two-and-a-half hours of sightseeing before the trip’s grand finale, a performance of the musical comedy Beach Blanket Babylon, at Club Fugazi. Beach Blanket Babylon is the world’s longest running musical revue. Created by the late Steve Silver in 1974, the show continues under the direction of his widow, Jo Schuman Silver. The performance follows Snow White on her journey to find her Prince Charming, and along the way encounters a cast of political figures and celebrities in a hilarious satire of current events. The evening ended with Uber rides back to Corte Madera for the final night of the trip. Sunday morning came all too soon and it was time to make the long drive home. No doubt that SCMM will be retuning to the Bay Area again in 2019. There is so much to see and do, and so many great roads to conquer — let the planning begin!